Though written in 3 different decades, these four books run along parallel routes that often meet and the separate, each providing insight for understanding the others. Each is about characters of Chinese heritage, about Chinese immigrants in the US, about the history and culture these immigrants bring with them. I mentioned three of these books in an earlier post, and having read the 4th decided it was time to say something about them all. Laurence Yep’s Dragonwings (1975, Newbury Honor Book) is set in San Francisco at the start of the 20th Century. 8-year-old Moon Shadow arrives from China to join the father he has never met, and the two grow close through their dream of designing perfect kites. Early 20th Century Chinatown in San Francisco is a warren of streets and shops, filled mostly with men who’ve clustered into guilds that provide entertainment, support, and sometimes revenge. Then the 1906 earthquake destroys the city. Although part of an extensive series, this book stands well on its own. Yep creates a small yet complex world that strikes all the right notes: historical accuracy, puzzling characters who eventually make sense, and even epic scenes that draw the reader in while also providing a detailed picture of this small community within a larger city perched on the boundary between the old country and the new. Donald Duk (1991), by Frank Chin, is my favorite of these four. Donald lives in San Francisco, where his father owns and is the chef at a Chinese restaurant. Chinese New Year is approaching, and Donald suffers typical teen-age angst. He wants to rebel. He hates his Chinese heritage and wishes he could be Fred Astaire. Then he begins dreaming of the men who built the transcontinental railroad in the 1860s, and of the 108 heroes of the Water Margin. When not dreaming, Donald befriends a Vietnam War vet, spars with his best friend, prepares to be a set of legs in the Chinese New Year’s parade’s dragon, and steals one of his father’s 108 model planes to set aflame and launch from the roof of his building. 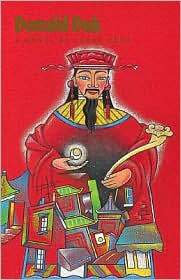 The stolen plane is Lee Kuey, the Black Tornado; the leader of the Chinese railroad workers is Soong Gong, the Timely Rain; Donald’s father plays Kwan Kung in a New Year’s opera. The 108 heroes come and go in various avatars, and Donald learns the real meaning of the Mandate of Heaven. China Men (1980) is Maxine Hong Kingston’s homage to her male ancestors who lived in China, Hawaii, San Francisco, and New York. 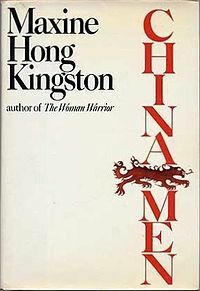 In a series of stories that are part memoir, part fiction, Kingston tells of 4 generations of male relatives: her great-grandfather who left China to work on a sugar plantation in Hawaii, her grandfather who worked on the transcontinental railroad, her father who owned a laundry, and her brother who fought in the Vietnam War. Kingston weaves folktale, myth, fantasy, and reality into a history of of the relationship between China and the US and a personal history of her own family. Gene Luen Yang’s American Born Chinese (2006) is a graphic novel about cultural identification and/or rejection. How do immigrants make a comfortable place for themselves in American society? Especially teens, who rebel against everything — how do they fare when others see them as they do NOT wish to be seen? To what extent can anyone reject his ancestral heritage? The characters in Yang’s novel grapple with these issues, and Yang’s drawings (colored by Lark Pien) are deceptively simple: no cross-hatching, unadorned backgrounds, flat colors without gradations. But small details are important: that white sheen across Jin’s hair — when it shifts, there’s a reason. Note the eye colors: blue, brown, black, even red (for an ogre). Yang’s characters, including the Monkey King, make journeys to variations on hell/purgatory, and each reaches a satisfying end. This entry was posted in Fantasy, Graphic Novel, Historical fiction, Newbery Award, YA Lit and tagged Frank Chin, Gene Luen Yang, Laurence Yep, Maxine Hong Kingston. Bookmark the permalink. Though I’m not likely to get round to reading any of these, they do sound intriguing, especially as having lived for nearly ten of my childhood years in Hong Kong I can appreciate the paradox of being in a community but not necessarily from a community. Not too long ago I read Gweilo, Martin Booth’s experience of growing up in Hong Kong around the same time that I lived there, and much was familiar to me — though he was much, much more adventurous and immersive than I ever was, even learning Cantonese (which I never did). Thanks for the recommendation. I’ll look into it. I enjoy Morris’s travel writing.